As most people know, Milton Keynes Dons have a very controversial history and are, because of this, one of the least popular clubs in the Football League. 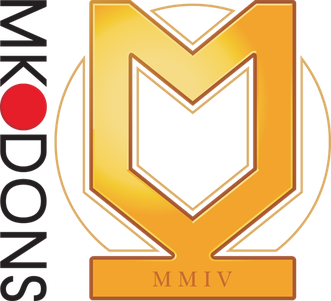 For those who don't know, MK Dons were formed in 2004 after chairman Peter Winkelman relocated Wimbledon FC to Milton Keynes (a move which also led to the formation of AFC Wimbledon, notably). Their first season in Milton Keynes - 2004/05 - saw the club struggle in League 1, only staying up courtesy of Wrexham's 10 point deduction for entering administration. However, MK Dons weren't so lucky the following season, suffering relegation to League 2. The following season saw MK Dons reach the League 2 play-offs, losing to Shrewsbury Town in the semi-finals. The 2007/08 season saw the club go one step further, winning League 2 and securing a return to League 1; they also appeared at Wembley in the final of the Football League Trophy, beating Grimsby Town 2-0. The 2008/09 season saw the club miss out on automatic promotion by just 2 points, before losing to Scunthorpe United in the play-off semi-finals. The 2010/11 season - Karl Robinson's first in charge of the club - saw MK Dons once again reach the League 1 play-offs, this time losing to Peterborough United in the semi-finals. This feat was repeated the following season, MK Dons losing to Huddersfield Town in the play-off semi-finals this time. The 2012/13 season saw MK Dons embark on their best ever FA Cup run, reaching the Fifth Round before losing to Barnsley. This was followed by a couple of lackluster seasons in League 1 before the club earned promotion to the Championship for the first time at the end of the 2014/15 season. However, the club struggled to compete in the transfer market and were relegated back to League 1 at the first attempt, finishing 23rd in the Championship. The 2016/17 season was another lackluster one for the club, with Karl Robinson resigning in October to be replaced by Robbie Neilson, who led the club to a disappointing 12th place finish. Teenager Sam Baldock struck his first senior goal as Milton Keynes Dons progressed to the second round of the Carling Cup at the expense of Championship club Norwich City. The 19-year-old striker, making only his second start, finished superbly after 34 minutes to eliminate two-time Carling Cup winners Norwich at stadium:mk. Darel Russell hit the post as Norwich fought back against their League One opponents but they struggled to create enough chances and lacked a cutting edge. Norwich looked the stronger early on with new signing Omar Koroma, making his full debut, heading wide after five minutes. Aaron Wilbraham had MK Dons' first opportunity when he fired over after 10 minutes but Norwich retained the upper hand at that stage. Wesley Hoolahan combined well with Arturo Lupoli and tried his luck from 25 yards but Willy Gueret saved well. Dons defender Dean Lewington had to be alert to close down a Koroma attack after the Gambian forward intercepted a Keith Andrews pass. Koroma spurned Norwich's best chance of the first half after a quick attack caught the Dons flat-footed. Wilbraham slipped in the centre circle and Hoolahan picked up possession. He played in Koroma with a well-weighted through-ball but his touch was heavy and Gueret blocked. Baldock made the visitors pay as he raced onto a fine pass from Andrews and confidently clipped the ball over David Marshall for a memorable first career goal. The Dons then finished the half strongly by winning four corners but Norwich resisted further damage. Glenn Roeder's men struggled to force their way back into the game after the break despite enjoying plenty of possession. Koroma had a chance just before the hour but sliced his effort wide and was substituted soon after. Russell went within a whisker of equalising with a curling 25-yard effort which crashed against the post. Norwich stepped up the pressure late on but could not find a way through and the Dons held on. Stadium:MK is an excellent ground which, in all honesty, is far too good for MK Dons: both because of their stature and because of the circumstances surrounding the club's very existence. The ground is an all-seater with an overall capacity of 30,500, with the possibility to expand to 45,000 should the need ever arise. Because of this high capacity, the ground is frequently used for other purposes, such as the Rugby World Cup, international friendlies and the Women's FA Cup final. The ground was also one that was a proposed host stadium in England's unsuccessful bids for the 2018 and 2022 World Cups. The record attendance for a Milton Keynes Dons game at the ground is 28,127 for an FA Cup tie against Chelsea in 2016. As before, I don't yet have anything for this section, and I am not sure when that will change as I don't know when Norwich are next likely to play against MK Dons (and I certainly wouldn't go for any other reason).